Takeaway: Garlic, onions, shallots, scallions and chives are all a part of the allium family. While many types thrive outdoors, others are better-suited to indoor gardening, thrive in hydroponic systems and deserve a place in the indoor vegetable garden. Dr. Lynette Morgan’s article has all you need to know to grow alluring alliums. Pungent alliums are one of the most widely used vegetables in the culinary world and include familiar white and brown bulb onions, garlic, shallots, scallions and fresh-cut herb chives. While the common types of alliums are grown on a large scale outdoors, some of the smaller, tender types are well-suited to indoor gardening and thrive in hydroponic systems. 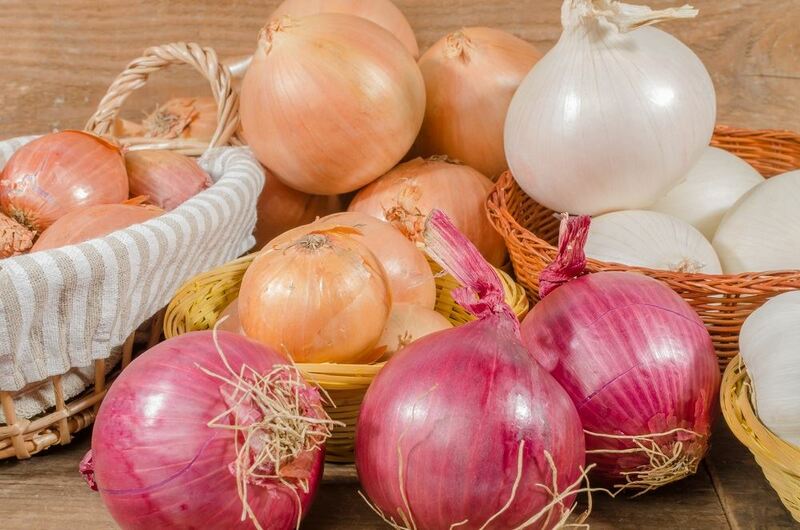 Onions and garlic are well known for their pungent aroma, distinctive flavor and certain health-giving properties. Alliums all contain organosulfur compounds that have antioxidant properties, making them protective against certain health conditions such as heart disease, cancer, high blood pressure and cholesterol. The concentration of organosulfur compounds in allium plants is due to the large quantities of sulphur that accumulate as the plant grows. Sulphur concentrations in excess of 1% on a dry-weight basis have been reported in bulbing alliums and much of this is partitioned into the healthy organosulfur compounds. The concentration of these important organosulfur compounds in alliums can be boosted under hydroponic production by increasing sulphur and nitrogen fertilization. Studies show that certain organosulfur compounds increase linearly with increasing nitrogen levels in hydroponic trials and garlic also responds in a similar way to increasing sulphur and nitrogen in the nutrient solution when grown hydroponically. This not only produces bulbs with a greater health value, but also increased flavor and pungency. While bulbing onions and garlic have the greatest health value amongst alliums, it is the non-bulbing types that are more commonly grown hydroponically. Non-bulbing types take up less space and are generally much quicker to grow than those that must be grown through to maturity as the bulb develops. Common chives and Chinese chives (also called garlic chives), and scallions or bunching onions (also called green onions or spring onions) are great additions to any hydroponic system and help round out the flavor profile of the herb and vegetable garden. These can be grown at a high density and harvested at any stage, from microgreens (at just 1- to 3-in. tall), to baby leaf or mature plants, with chives able to be partially cut many times over a long growing season. Bulbing onions and garlic take a longer time to mature than bunching onions or chives and many are day-length sensitive, meaning they are triggered to start bulb production under certain day lengths (there are both long-day and short-day varieties), although some day-neutral cultivars do exist. This is of particular importance to indoor growers who can manipulate their day length. Cultivar selection is important if bulbing onions are to be grown. Common chives and garlic chives have been grown in herb gardens for centuries and are now a widespread commercial hydroponic crop. Both the leaf and flowers of chive plants are edible with chive flowers also being cropped for culinary use. Fresh chives have a mild onion flavor, while Chinese chives have a garlicky overtone and a flattened leaf shape. Both are perennial, cool-season plants that prefer good light levels combined with temperatures from 50 to 77°F. Temperatures exceeding 81°F will promote the formation of flower stems, which restricts foliage development. Chives can be either propagated from seed, which is more common under commercial production, or by division of a mature plant. Seeds germinate easily within eight to 10 days when temperatures are between 60 and 64°F and are best raised in a separate nursery area and then transplanted into the hydroponic system at three weeks of age. Both chives and garlic chives are well suited to a wide range of hydroponic systems. Nutrient film technique and other solution culture systems are ideal if plants are to be grown for only a short period and harvested young. Mature chive plants can develop a sizeable root system, so are not suitable for small nutrient film technique channels. Chives will grow year-round provided they receive a suitable, long day length as dormancy is induced by day lengths of less than 14 hours. If shorter day lengths are provided, the plants will go dormant but can be forced back into production once the rest period has been broken by cold or hot temperatures. Dormant chives that are brought into an indoor garden to be forced can be treated with hot air between 91 and 97°F for two or three days to break the dormancy and induce fresh growth. Garlic or Chinese chives are similar to common chives, but they grow slightly larger, have flattish leaves and produce clumps of four to 19 small bulbs that may be eaten along with the foliage. Garlic chives produce a heavier leaf and are higher yielding than common chives. They also multiply faster, produce well at temperatures between 62 and 66°F and have a day length of 17 hours. Once temperatures drop below 41°F, they tend to go dormant and will resume growth when temperatures are increased. Apart from the standard green leaf, garlic chives can be used to produce a high-value, blanched product with a more subtle garlic flavor. Blanching involves growing the plants in the dark, or using lightproof covers over the top of the crop. With indoor gardens, potted garlic chive plants can be simply moved to a dark cupboard or other area for a few days to allow blanching to occur. The resulting foliage is soft, yellow and highly valued for certain culinary dishes. Large onion bulbs can be grown in hydroponic substrate systems, but given the space required and long production time, it is often more viable to grow the gourmet types of button or globe onions that have become a specialty line in the baby vegetable range. With a milder flavor and range of shapes and colors, baby onions can be grown at a high density and harvested for fresh use or pickled. Italian button onions are popular and well suited to shallow media beds. This species includes varieties such as Borettana and a small button onion called Cipollini in Italy, with red, white and yellow varieties of button onion to choose from. These onions are harvested when only 1 in. in diameter and have a flattened dish shape. For hydroponic production, onion seeds can be either directly seeded into the production bed/container, covered with a fine layer of vermiculite or coconut fiber and later thinned to the correct spacing and density, or sown elsewhere and transplanted as sets when large enough to handle. Small button onions can be grown at a high density with 1-in. spacing between seedlings and will produce clean, shell-shaped bulbs in a suitable growing media such as perlite, vermiculite, coconut fiber or rockwool. Avoid using harder media such as gravel and expanded clay as it can lead to misshapen bulbs. Shallots and other multiplying onions are milder, sweeter and more delicate than standard bulbing onions and are commonly used in Asian and French cooking. One major advantage with shallots is that they form clusters of small bulbs, much like garlic, from which they can be propagated from year to year. Planting a shallot set (small bulb) is quicker than growing other onions from seeds and growers can collect and save a few bulbs from each plant for starting the next crop. Shallot sets sold for planting out in spring are typically sold by the pound (with around 30 sets per pound) and there are a number of varieties to choose from. These should be planted in the hydroponic substrate with the top of the bulb approximately 1-in. below the surface. Green shoots will rapidly develop from the pointed top of the set and roots from the base, and are ready to harvest in 80 to 95 days. In hydroponic beds, 4 to 5-in. between shallot plants is ideal as they will develop a cluster of new bulbs around the central mother bulb. Space is required for these to form. Shallots are more tolerant of warmer temperatures than other types of bulbing onion, with ideal conditions in the 50 to 86°F range. Garlic is another bulbing allium grown from individual cloves, which may be pre-sprouted for a few days in water before planting in hydroponic media beds. Elephant garlic, which is actually a form of leek, produces huge bulbs with a milder flavor than standard garlic. Both types of garlic can be grown in a similar way in hydroponics to standard bulbing onions. Leeks and scallions (also called green onions, bunching onion or spring onion) are grown for their foliage and white, succulent stem base. 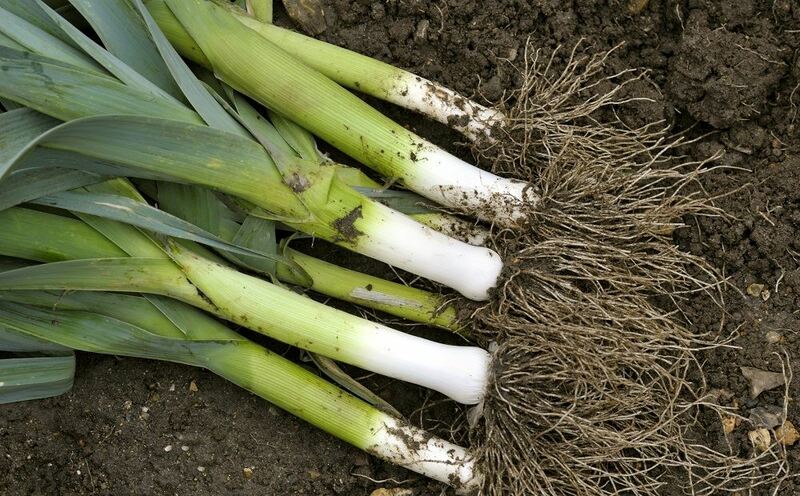 Leeks don’t form bulbs, although some scallion varieties may form a slightly swollen stem base. Leeks are large plants at maturity, so in hydroponic production are often harvested while still relatively young and immature as baby leeks to give a mild flavor to many dishes. Scallions can also be harvested at any stage from seedlings (microgreens) of only a few weeks old, to full-sized bunching onions to be used fresh in salads. The sowing density of seed for leek and scallion production depends entirely on when the plants will be harvested. Many indoor gardeners will sow seed thickly and harvest thinnings for microgreens and later on further increase spacing by harvesting more young plants and finally allowing the remainder to mature. Scallions come in range of varieties including white- and red-stemmed types. High levels of light are required for scallions, particularly if a deep red coloration is required. Hydroponic alliums generally grow well on a standard vegetative formulation. Boosting levels of nitrogen and sulphur will increase the flavor and organosulfur compounds in the plant. Plants grown under stress, with high EC or low moisture levels in the substrate, will also concentrate flavor compounds in the plant, but with some already rather pungent alliums that may not be desirable, and may also induce premature bolting (flower formation). The pH levels for hydroponic alliums are best maintained at 6 to 6.5. They should have an EC of 1.8 to 2. Indoor alliums are prone to similar pests and diseases as many other hydroponic vegetable and herb plants. These include thrips and aphids, including the black onion aphid. Use of oil/neem sprays and botanical/organic insecticides provide some control if applied frequently enough and screening of the indoor growing area can largely prevent these pests from entering from outside. Where allium plants or clumps become dense and under high humidity, fungal diseases can take hold. Selective removal of older foliage, plant thinning were seed has been directly sown and a good a level of air flow helps prevent diseases. Sprays of bicarbonate-based products such as sodium or potassium bicarbonate or soluble silica can also help control and prevent fungal disease under humid conditions. Hydroponic alliums provide a wide range of options for indoor growers, from delicate microgreens to baby button onions and mature pungent bulbs. Being both easy to grow with a good selection of modern cultivars and well suited to hydroponics, alliums are worth experimenting with.